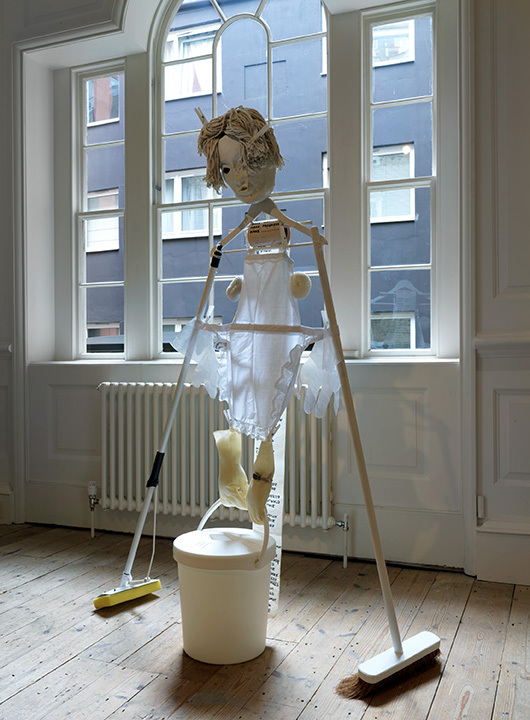 A cluster of rooms in a 18th Century Huguenot weaver’s house in Aldgate has recently been sent back in time to the spring of 1974, as ‘56 Artillery Lane’, a group exhibition at Raven Row which takes inspiration from the feminist collective S.L.A.G. 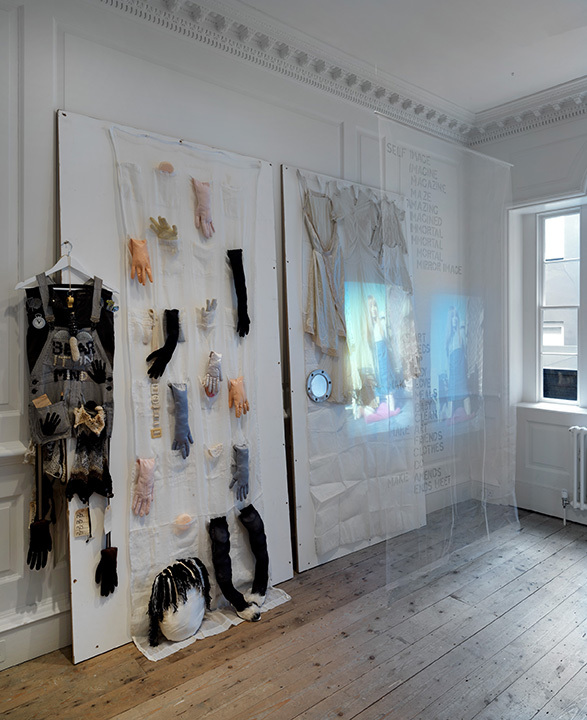 (South London Art Group) who, in 1974, transformed a former domestic space, South London Women’s Centre in Lambeth, to create ‘A Woman’s Place’ – which served as both an exhibition and an immersive artwork in itself. Located in a squatted house, South London Women Centre was one of many repurposed community and activist spaces occupying disused buildings at the time. S.L.A.G took advantage of the domestic nature of this setting to offer a critique of family life. 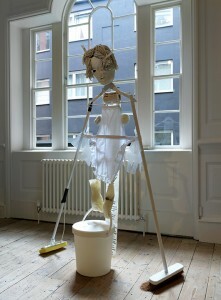 ‘56 Artillery Lane’ similarly takes place within a domestic setting, and the exhibition as a whole seeks to imagine ‘home’ as ‘a space for social, sexual and political agency, and the ‘domestic’ as a stage on which kinship and self are formed and transformed through acts of love, cruelty and indifference.’ The exhibition does not seek to explicitly restage the S.L.A.G artists’ earlier creation. This would have been impossible, partly because A Woman’s Place was always meant to be an ephemeral happening, and little documentation of the exhibition remains. ’56 Artillery Lane’ instead takes its predecessor as a point of inspiration and departure, presenting the works of contemporary artists who offer a multitude of perspectives surrounding the domestic, both within the exhibition and the accompanying programme of events. The relationships between past and present plays out in myriad ways. One element of the exhibition is a publication produced as part of the research process titled ‘14 Radnor Terrace: A Woman’s Place’. The book reflects rigorous research, carried out in archives including the Feminist Library, through oral histories and in collaboration with the families of some of the original artists. 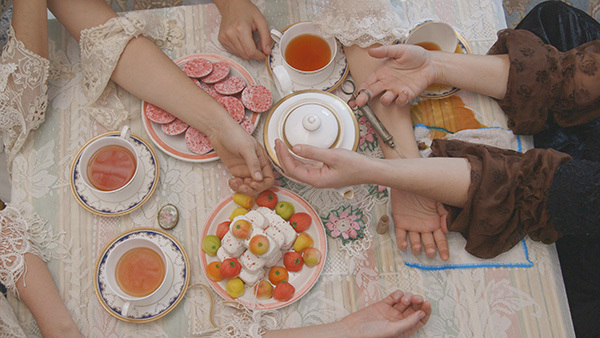 It contains archival documentation including posters and newsletters, and even the comment book from the original show, prefaced with an essay by editor, Amy Tobin, who considers the legacy of ‘A Woman’s Place’. 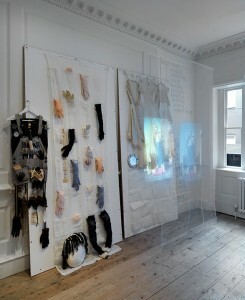 Among the works with the most contemporary feel are Lucy Orta’s Refuge Wear, shown on the ground floor. Pieces of equipment evoking both leisurely outdoor pursuits and survival, such as tents and sleeping bags have been refashioned – rendered as strange hybrids, with a hood protruding through a tent, or a conjoined pair of sleeping bags. The objects are absurd, evoking strange mythical beasts, but also uncomfortably familiar, calling to mind scenes of rough sleepers or refugees. The fact that the latter occupy so much of our visual field in news broadcasts in recent months and years make these sculptural objects particularly affecting, and it comes as a sad surprise that they were actually created in the 1990s, reminding us that for so many, the search for refuge is not a new thing. On the upper floors, among the newest works in the show are Poison the Cure (2017), a film by Jenna Bliss specially commissioned by Raven Row, which plays with the history of pharmaceutical trials in Puerto Rico, thus bringing imperialism to the fore, and An Evening With the White Queen (2017), a 360˚ video work by Martine Syms accompanied by wallpaper and drapes created by the artist for the space. It is a real pleasure to see such fresh contemporary works alongside those such as Fenix˚, originally created by Su Richardson, Monica Ross and Kate Walker in 1977 and reinstalled here by Su Richardson. This and other works on show from the 70s and 80s call to mind the Feminist (with a capital F) art I remember seeing in museums throughout childhood and adolescence, and it feels important that they should be brought into dialogue with young feminist and queer artists working today. ‘56 Artillery Lane’ continues at Raven Row until 11 June 2017. The accompanying publication ‘14 Radnor Terrace: A Woman’s Place’ is now part of the Feminist Library’s collection.